MHI is the only national trade organization representing all segments of the factory-built housing industry. 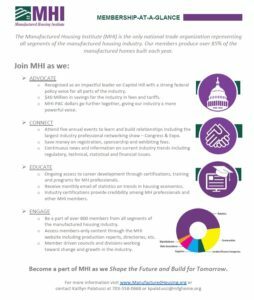 MHI members include home builders, retailers, community operators, lenders, suppliers and affiliated state organizations. We provide an array of industry education programs to help members gain knowledge and industry skills through dynamic learning processes, networking opportunities and federal legislative and regulatory policy support. We have prevented many burdens from being placed on the industry and customers, and have made substantial headway in dealing with financial reform, energy and HUD regulatory issues. Don’t miss out on the opportunity to be an active member of the industry’s only national traditional trade association. It makes good business sense and helps promote the factory-built housing industry’s position as a provider of quality and affordable housing for millions of households in America. MHI protects and promotes manufactured housing’s interests with federal policymakers through lobbying, monitoring and analyzing numerous federal legislative and regulatory issues and proposals, providing written comments and testimony, engaging with other industry trade groups and taking legal action.